Kimchi originates from Korea, and roughly means “pickle.” There are hundreds of ways to make it, offering an unlimited canvas on which to paint different flavors. Use any crunchy fresh vegetable. Tweak the flavors in the paste by varying the amount of ginger, garlic, fish sauce, and red peppers (or by adding any other ingredients) to customize the taste exactly to your liking. Soak the cabbage and radish (if using) in a 5% (salt to water ratio by weight) brine, from 30 minutes to 4 hours. Drain (but do not rinse) the cabbage and other veggie pieces. 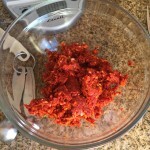 Next, make a paste using soy and fish sauce, aromatics like scallions, ginger, and garlic, and red pepper powder. 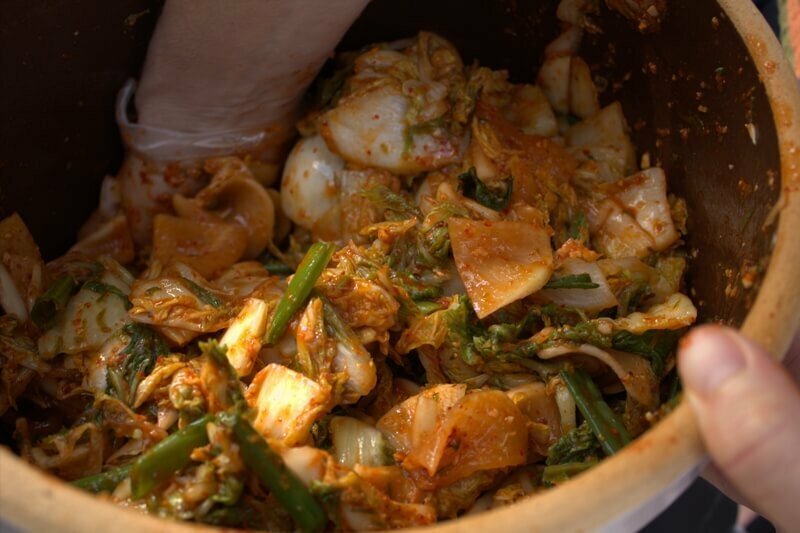 Slather up the soaked veggies in the paste in order to prepare the mixture for its short fermentation journey to kimchi. Finally, pack well-mixed contents into a jar or crock. Weigh it down and cover with a cloth, or use a small-batch fermentation device to minimize air and let gas escape. 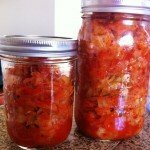 The length of kimchi fermentation can vary widely according to the season and your location. Some prefer to do a short (2-3 days) ferment at room temperature, and then transfer to a refrigerator for further flavor development. 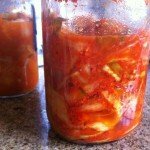 In the southern California coastal climate (USDA hardiness zone 10a) where I live, I find that 9 days fermentation time is perfect for this recipe most times of the year. Once moved to the refrigerator, fermentation activity is dramatically reduced, but the flavor slowly continues to develop and improve as it sits several weeks in the fridge. In fact, many Korean households have special kimchi refrigerators for that purpose. These special high-tech fridges maintain slightly warmer temps than typical refrigerators (55F versus 40F), use “direct cooling” and can be set to “fermentation mode” to closely simulate the traditional earth temperature conditions when burying an onggi (crock) halfway in the ground. Experiment with different times and keep track of what works best in your climate. Most traditional kimchi recipes are spicy and use red pepper powder, known as kochugaru or gochugaru (gochu means pepper in Korean). It’s available at most Asian markets. 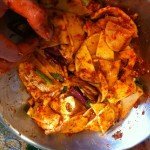 Kimchi can also be made with fresh peppers, too. 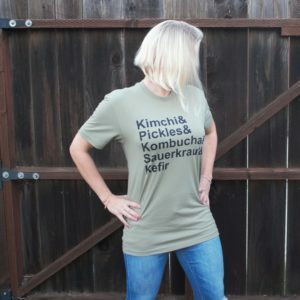 And any style of kimchi made without chile peppers is considered white kimchi. When buying gochugaru, look for a coarsely or medium sized grind. And make sure that red pepper is the ONLY ingredient. Some brands include salt or even preservatives. We want to control our own salt level, so only buy the pure stuff! Most brands are made from peppers grown China. 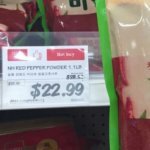 Prices for most Chinese grown pepper powders range from $5 to $8 per lb (450g). 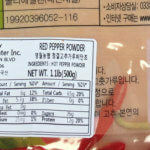 Korean pepper powder is less intensely red than the stuff from China. Labels can be tricky! Even the brands which are “Product of Korea” may only have been packed there. It is difficult to know the murky origin of the actual peppers inside the package. We finally found truly Korean-grown gochugaru. It cost about $25-$30/lb./500g. This brand is seasonally available (we found this in late September) at HMart, an Asian grocery chain in the U.S. You can also order it online here. More info about this product (in Korean) here. really really grown in Korea! 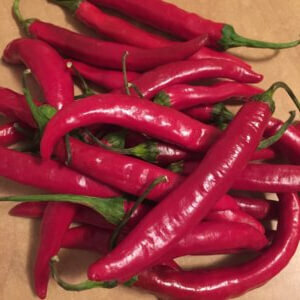 If you have a green thumb, you can also grow your own hot peppers in the summer and then dehydrate them to make your own gochugaru. That way, you can use any kinds of pepper variety you like. 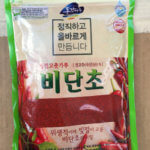 When shopping for seeds, the variety is often simply called “Korean hot pepper”. 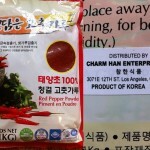 SIDEBAR: How Hot are Korean Chiles? 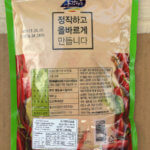 Korean peppers don’t appear on common Scoville scales (the scale that’s used to rate hot peppers relative to each other). Based on our research, it seems like they may be around 10,000 (?) Scoville units, somewhere hotter than a jalapeno but not as hot as a cayenne or habanero. 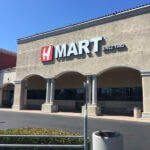 Source  and . A gloved hand is a happy hand! Stir salt into water until it dissolves. 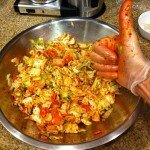 Remove any “floppy” outer leaves from the cabbage (Compost or reserve for another use.) Chop the cabbage into 1-inch chunks/strips. Slice the core very thinly. 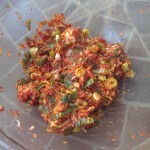 (Some discard the core; I include it to give the kimchi a varied texture). Peel and cut stems off radish. 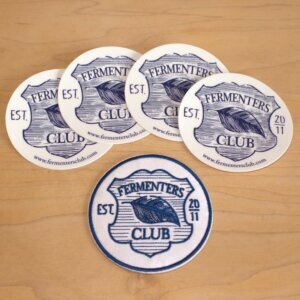 Cut into ¼"/ 6mm thick and about 1-inch diameter slices using a mandoline, V-slicer, or knife. Add cabbage and radish pieces to the brine in a large container or mixing bowl. Cover with a something to weigh the veggies down (I use a glass wine bottle filled with water in a one-gallon glass container) so that the contents stay under the brine. Brine for 30 minutes to 2 hours. Drain the veggies through a colander, reserving one pint/ 500ml of the brine. Chop the scallions (using both the green and white part) into ½" /13mm slices. Add to the mixing bowl of a food processor. Peel and roughly chop the garlic and peel and slice the ginger. Add to mixing bowl. Add pepper powder, soy sauce and fish sauce to mixing bowl. Vegan variation: omit fish sauce. Run food processor until ingredients are all incorporated and a thick paste forms. It will be finished when it "rolls" over in a donut shape in the bowl of the food processor. You can adjust by adding more tamari/soy sauce if it needs to be wetter, or more pepper powder if it needs to thicken up. Chop the scallions (use green and white part) into ⅛"/ 3mm slices. Add to a small mixing bowl. Peel and grate the ginger, and mince the garlic into a fine dice, and add to bowl. Stir and mash contents (or pulse with food processor) together until a paste forms. You can adjust by adding more tamari sauce if it needs to be wetter, or more pepper powder if it needs to thicken up. Now the fun part! Wear a latex or plastic glove to protect yourself from the heat of the paste and keep your hands from smelling like garlic and fish sauce. You can mix the veggies and paste together in a separate large mixing bowl or directly in the fermenting container. Mix the paste and veggies thoroughly with your hands, coating each morsel. Pack mixture tightly into a glass or ceramic vessel. Ensure that the top surface is even and flat (discourages surface mold from forming). 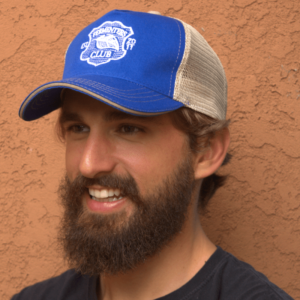 If using a small batch fermentation lid, add weight(s) to the jar, then apply fermentation lid. If using a crock or wide-mouth vessel, add a plastic lid or plate on top of the contents, and a weight to press down and keep contents under the brine. It may not seem very "briny" when you first pack it, but brine will continue to form once the veggies are pressed down. Secure with a cloth and rubber band to keep flies out. Check after one day; the contents should have formed a brine. If the veggies are not completely submerged, top it off with some of the reserved brine. Store in an out-of-the-way spot in your kitchen or house for 5 days. Note: Your house will smell like kimchi. 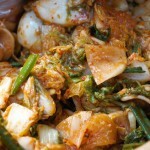 Many prefer to "age" kimchi in the refrigerator after fermenting at room temperature. The taste will continue to develop (although very slowly). 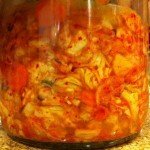 Kimchi will keep in the refrigerator for many months.